Yes old crater face Silverton was going on and on about it tihs moring moaning why the papers hadn’t made more of Palin’s ‘target map’. Seems that Palin gets the blame for everything from the left, the BBC clearly want to hype up the anti Palin stuff even though as far as I’m aware the nutter who did this NEVER mentioned Palin on any of his web postings. With BBC News in the hands of such blatant left-wing hatemongers, how can any self respecting Conservative MP – how can any self-respecting democrat – sit in the House of Commons and not protest against such obscenity and demand action to remove these patently unfit people from their positions? Who did they blame when Stephen Timms was stabbed by a Muslim women. I forget. Is this what the BBC sees as incitement to commit murder? Unbeliveable. 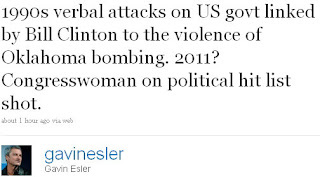 The use of images of cross-hairs, as Toby Harnden points out, is hardly unusual in politics. Quite the reverse. The Right uses them, the Left uses them, the media uses them, Guido uses them. We use them in Britain. It’s standard political imagery. They’ve never been cited as incitements to murder before. The attempt to link Sarah Palin’s use of them to this murder spree is surely silly, opportunistic and shameless. Even if the man had a right-wing political motive (for which there is even less evidence than that he had a left-wing motive), the BBC is wrong to keep pushing this – without giving someone the chance to counter it. They are giving one side’s view, which – as DB has shown – coincides with their own view. Where’s the genetic impartiality here? Left-wing American bloggers may do it if they like, but the BBC should try being impartial and stop insinuating a link. And this idiot works in the BBC college of journalism. Notice how he does not check out his sources first. If he did he would see how “Sarah Palin put a bullseye on the Arizona congresswoman” is nowhere near the truth. Is this what passes as honest journalism these days? I had hoped that for once the left would not sink to this level. My hope was not strong, as I hold a very low opinion of their integrity and honesty, but still had a tiny hope they would not be so sick as to turn this tragedy into a dirty, disgusting, stomach churning, vomit-inducing piece of petty point-scoring. However, I was neither shocked nor surprised to see them decend this low. It’s just par for the course and is probably even worse than that disgusting “Good day to bury bad news” memo on 9/11. We know who to blame if anything happens, don’t we? One thing that has shocked me is how little coverage has been given to the murder of the young child yesterday. Politicians and judges must accept a degree of risk in their job, yet this little girl has had almost no mention at all from the media or the politicians faunicating all over the airways. Give’m time Martin. The little girl tragically murdered by a pathetically deranged lunatic will, whatever the truth of the matter, become a secular saint in the war against the Tea Party. In the same way Stephen Lawrence, who died at the hands of white criminals, has become a secular saint to race hustlers everywhere and a convenient poster boy in the successful effort to emasculate the upholding of race-blind law by the police. Well you just aint right wing then, izyuh? I dont know of one conservative who would not happily blow away a child if they thought they might vote Democrat. Any fool wots knowz that. Dontcha watch the BBC mate? Well that may be because the little girl’s father still supports the freedom to bear arms and has stated very calmly that occasional tragedies like this is the price we pay for a free society, and he would hate the alternative. What I think is really telling is there is not one conservative pundit out there pathetic enough to suggest from this information that the murderer is a left-wing Democrat who killed M/s Giffords for being a moderate. On the Left, no end of the pathetic scumbugs doing the opposite. If the Left faced a moral audit it would make our financial crisis look like a boom. Has anyone been shot in any of these states recently? If so the democrats are responsible. Isn’t this a joke. I know there is no intention to incite political assasinations by writing such a piece and so do most reasonable people. But the media including the BBC, The Mail and the Mirror really push the idiotic notions that mass murder was a result of some political map. The BBC are not a first class news organisation but a corporation staffed with left wing idiots who should be dismissed from their posts for suggesting such a conspiracy. Sorry, JHT, I didn’t see this before posting a link to that map on the thread below. I wonder if this shouldn’t be given a post of its own, highlighting BBC hypocrisy. I did actually link to that map in my blogpost above – see “used by the Democrats”. It’s that dilemma about what one links to (risking that it gets ignored) and what one reproduces in the blog. Guess I should’ve posted the map. Sorry DB did not click on that link. You’re forgiven. Just this once, mind. Yes, DB, I meant posting the map in full. Great post, though. You got all the hypocritical Beeboids lined up in a row. Just make sure you dont put any cross hairs on them, the Police might arrest you as the accomplice they’re looking for. It says they all know that they have free rein to be biased and M/s Boaden’s comments were just for public consumption. Just like the way Chris Summers and his boss flagrantly ignored David Jordan’s ‘strictures’ on impartiality by having a Labour Council candidate dealing with election complaints. When Jordan and his colleagues put together these documents on ‘impartiality’ and their staff read them, they must all have a really good laugh. One imagines that when they get issued a memo goes out asking staff to take extra care not to spill coffee on their computers. When the BBC’s latest editorial guidelines came out last year I suggested that they must be printed on toilet paper. I have to say, that until this moment I thought Congresswoman Giffords was dead. I’ve just read in the Telegraph it was a false report. I’m sure like any democrat, we all feel a tremendous amount of relief and joy at that, while not forgetting those who were killed in the senseless attack. I cannot help but wonder though, I think it has to be said, if the moral monstrosities pedalling the obscene slander that Sara Palin is to blame do not at least feel a tinge of disappointment that Congresswoman Gifford has survived? BBC-Democrats seem less concerned with the murder of Arizona Judge John Roll, who was appointed by Republican President George Bush, Sr.
BBC News Channel just had Rajesh Mirchandani’s report from Arizona. The BBC is now admitting that the murderer was mentally unstable, and that he had made some anti-government comments, but have censored certain information from their reporting. Mirchandani (or a producer with a camera while he was doing something else) got comments from two of the murderer’s high school classmates. Both of them said that he was a loner and always weird, and just got weirder after high school. The Beeboids are speculating right now what might have driven the nutter to commit murder. So he was LEFT WING, and was angry at Gifford before anyone ever heard of Sarah Palin. Nothing to do with Fox News or political talk shows. All those Caitie Parker tweets were in my original blogpost above. And not via a link – actual see it for yourself stuff. Are my bloposts so boring that everyone gives up after the “Read More” bit? Possibly, but I don’t think so. I for one didn’t see the “Read More”. Even if someone tells me to read more and I see that instruction, there is quite a strong chance I won’t do so. Dont be so glum! It was a first class piece, but I’m sure not everyone referred to each link you posted! Apologies, DB, I was trying to show that the BBC was quoting the same people but censoring news that was printed in the NY Times. I was upset and forgot to credit your post. Hey, I’m joking. I bore me. Female Beeboid on the News Channel just now asking an Arizona reporter if the Democrats are going to do anything about “lax” gun laws. Now the AZ a-hole is blaming Palin’s target map and a local TV ad with a target on Giffords. 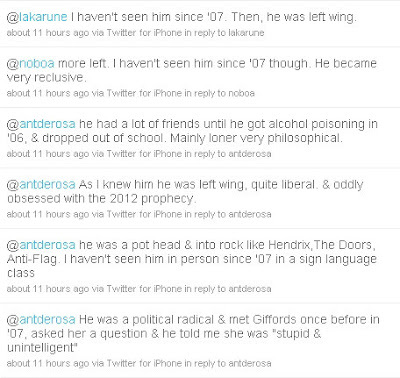 No mention whatsoever of the murderer’s statement that he didn’t like Giffords in 2007, and that he was already unhinged. BBC laps it up, and continues to push the Narrative that only Republicans use the target meme, continues to blame Sarah Palin, and continues to censor the news that the murderer is a Leftoid who likes the same political manifestos they do. Typically good observations on this subject from Autonomous Mind. Nice comparison by Natalie Solent, sometime of this parish. Tomasky was a JournoLista. Say no more. I try not to stray from the subject of BBC bias but if you want to read an article that shows how low British left-wing journalists can sink, read this from the Guardian‘s Ed Pilkington – a masterclass in bullshitting, newly-written yet based on no new information. He misses out all those inconvenient scraps of information we’ve had all day about the possible left-wing aspects to the killer’s beliefs and uses only those that can be construed as right-wing ones to build an attack on the Tea Party, Fox News and Glenn Beck. Pilkington twists the incoherent ravings of a killer into a coherent right-wing ideology, by interpreting like crazy. It’s easy, if you’ve got no shame, to be that sort of journalist. And, if you’re a Guardian writer, your readers will lap it up. What’s puzzled me throughout the day is, with all the feverish speculation about this creature’s ideology, no-one seems to have pointed out another possibility. Someone who includes Mein Kampf among his list of favourite books and then tries to murder a Jewish congresswoman could just be an anti-semite. Why is no-one speculating about that? I would like to say that this level of intellectual dishonesty shocks me, but unfortunately my opinion of the Left-Wing nutjobs like Guardian writers and readers is so low that this doesn’t even mildly surprise me that come out with this evil rubbish. Because Jews are fair game now that israel is the evil state. 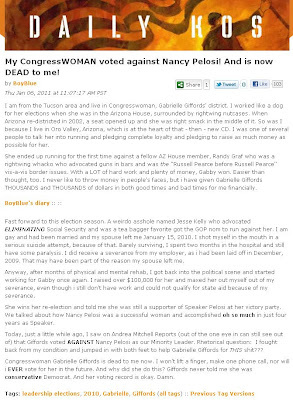 Did I hear right that this nut job tried to see the Congresswoman back in 2007? I just wonder what ‘rabble rousing’ Sarah Palin and the Tea Party were doing back then……. Mark Mardell started the blame Palin game on last night nights BBC news. Its just so the left wing way of doing things. 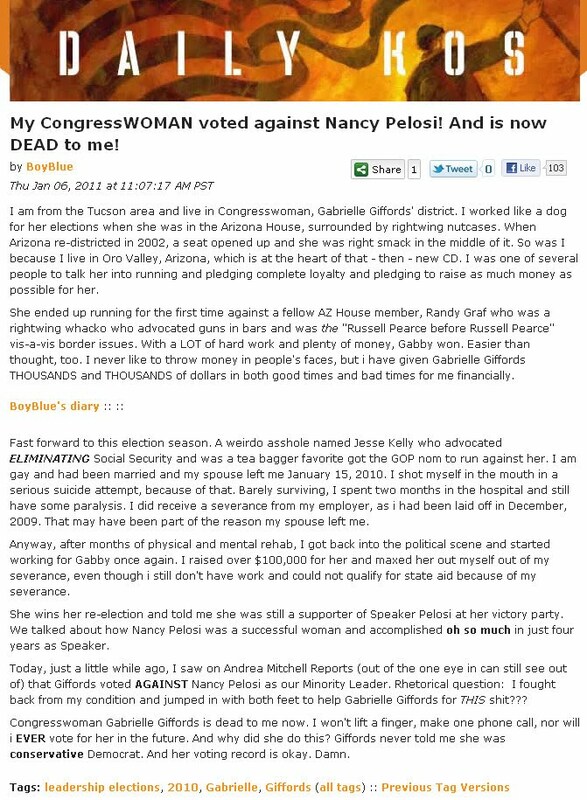 So we know this guy had a letter from the Congresswoman from 2007, so did he have a fixation with her even before that? Don’t expect the BBC to report this though, it seems Fox is the only network doing this so far, the BBC will simply continue to spin the lies that it’s all the fault of Palin and Glenn Beck, the BBC are taking their reporting as usual from the leftie hate sites. Apparently some obnoxious messages are being deleted from Sarah Palins facbook. Here is the BBC College of Journalism represetative again. Journalist. Broadcaster. Communicator. Ex TV newshound. BBC Social Media trainer. This complete fabrication came from that Wendy Bailey. That one should be investigated by the police. Oh purlease! Sara Palin’s bunch put a map up suggesting there were 20 folks to target in attempts to out Democrats who voted for Healthcare reform. With crosshairs. Posts a note about not retreating, but reloading. Then after the shooting, suddenly deletes said map, and any quote/reference that could be seen as incitement to violence, whilst EVENTUALLY posts note passing on condolences, mixed with ‘not me, gov’ sentiment. It’s reported by most media operations in the US, bar ‘Fair and Balanced Fox News’, but because the BBC report it, it’s biased? Jesus you lot are desperate. Oh and not forgetting the notes on Facebook where one guy suggests that getting Giffords was a start because she’s Jewish, pro-health care, anti NRA, and pro gay. 1 down, 16 to go.. it says. plus another suggesting that shooting the 9yr old was a good idea because for all we knew, she would possibly grow up a bleeding heart liberal. Not forgetting how quickly Palinites have cleansed Palins Facebook Wall of any criticism, even faster than usual, but left the note about it being a good idea to kill a 9yr old for a fair bit.. I know this is a BBC bashing site. Can we please refer to references on non-BBC sites that say the same thing as the BBC? Mark Mardell was NOT the first person in the UK to highlight the Palin Map. For such a load of alleged hi-brow twitter followers, a simple search on the subject on Saturday night, had the Palin links WAAAAYY before Mardell mentioned it. Ok he was the first on BBC, as no one had mentioned it on News24, a point many non-BBC twitterers found annoying in its absence. Ok so the guy wasn’t Tea Party-esque in the conventional form. He was anti-US Government, anti-healthcare reform, bit extreme. Bit odd. How many Tea Partyers do you see/hear on any media that would pass as normal, cogent, sensible not-gullible human beings? Obama being muslim because of a non-Caucasian middle name? Does that make Chris Martin’s kid a fruit? They can only produce a copy of his Hawaiian birth certificate, so he’s actually born in Kenya? Seems normal, don’t you think? Try reading the whole thread and see the proof which shows the shooter as much more in line as one of your fellow lefties. This is a site holding the BBC to account, so where the BBC is yet again lying, and exploiting this tragedy to push its own sick agenda you actually find yourself in support of its actions. You must be equally sick in the head. Apparently some Palin references were removed, so were some Democrat pieces, including some even more damning than anything Palin’s people had come up with. Try opening your eyes and your mind, otherwise you will remain in your pit of self-delusion, bile and hate. You’ve got yourself into a fair old state there but you haven’t addressed most of the points that have been made on this site about Beeboid Bias and double standards in regard to Sarah Palin. Have you read the rest of the threads that highlight the difference between Beeboid favourable treatment of an Islamic murderer at Fort Hood and grossly hostile and vivious treatment of Sarah Palin who hasn’t killed anyone, doesn’t want to kill anyone and is no danger whatsoever to anyone? Same with the disparity in treatment of Obama the Worshipped, the Democratic Party, Rev Wright and the treatment of Sarah Palin. I meant “vicious treatment of Sarah Palin”. If any children get blown up for not towing the AGW line, then people like Richard Curtis will be responsible. The incitement here is clear unlike the tenuous links you have made to some woman in Alaska and the horrific killings of innocent people by a mental case. Would you agree? Maybe Roger should read this ans see how stupid it all is. If Sarah Palin’s crosshairs are to blame for this nutjob killing, then it logically follows the NUS is directly liable for all violence done to people and property at their first riot – I mean ‘demo’. Remember ‘Demo-lition’ on the NUS flyers? Send the bill to the NUS, then. Hmm, that Grauniad piece would be the piece opposite the link on Guido’s site that highlighted this learned piece. The piece that, along with a piece on the frontpage of the Indie, was IIRC trashed in both BBC and Sky paper reviews. Sorry, but it’s pretty desperate to suggest the views of some BBC Essex bod would sway one’s views? Sorry, but if every other (non Fox News) news outlet in the States was making the link between Palinites, maps, crosshairs etc. 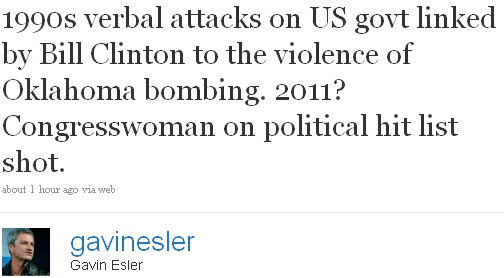 and the shooting, and twitter feeds were full of pleas that no UK media were making the link (until Mardell), how can the BBC be said to be leading the anti-Palin bias? Not even the saintly (I guess) Sky News mentioned until well into the cycle any Palin refs. By this time the seemingly guilt-free Palinites had started their cleanup campaign, and then, a long time after that got under way, issued a statement. I’m not sure what certain digs were meant to imply. That I’m pro-BBC, therefore a Grauniad reader, but would miss their front page splash. That I’m a left wing Tory voter, because I don’t see bias in everything the BBC says/does. No doubt some on here would, it seems see left-wing bias if Glenn Beck came out and said he was against such assassinations. He did come out against violence (but replaced his image on his website in a Daniel Craig/Bond style pic with a nice handgun). Are you on some medication? Try putting full stops in your sentances. Then you may make sense. Btw, seems a BBC reporter might have tweeted a few pro-Crawley Town tweets last night. Not seen lengthy blogpost quoting the Sage of R5, Richard Bacon, the doyen of free thinkers (in his dreams!) or the agenda setting views of Bod from BBC Radio Essex on the topic..
Can’t have opinions on the BBC, now, can we..